Portland-based group's exhibition shows variety in technique at Glenn & Viola Walters Cultural Arts Center. A new display of artistic prints is here in Washington County to prove originality isn't dead. Glenn & Viola Walters Cultural Arts Center, located at 527 E. Main St. in Hillsboro, is housing "P.A.N. Portfolio." The collection exhibits 42 artists from Print Arts Northwest, a nonprofit based in Portland that is an advocate for contemporary printmaking. On display until Jan. 25, 2019, and free for public viewing, the prints show a variety of color, forms, lines and shapes. Art aficionados shouldn't miss this, Print Arts Northwest board member and artist Jules Altfas said. "This illustrates a range of printmaking, and it is a good survey of what printmakers are doing these days," Altfas said. "If anyone is interested in that subject, this is a good way to see it." Prints have the connotation of being reproductions of other artworks, but printmaking is historically a process with independent techniques and designs. All the prints in the exhibit are the same size, for the sake of continuity and to show off techniques like etching, engraving and block printing, Altfas said. "Many people are drawn to printmaking, but find the art form a bit mysterious," said Bridie Harrington, The Walters' cultural arts program supervisor. "The wonderful thing about this exhibit is the range of fascinating, diverse approaches to the medium and the creative process. From monotype, woodcut and screen-print, to techniques that might be less familiar like dry print, solar plate, intaglio and more, we hope there will be something to interest everyone." Print Arts Northwest was founded in 1980. The organization holds workshops, tours, print exchanges, studio visits and demos around the Pacific Northwest. Altfas has been involved with Print Arts Northwest for 30 years. 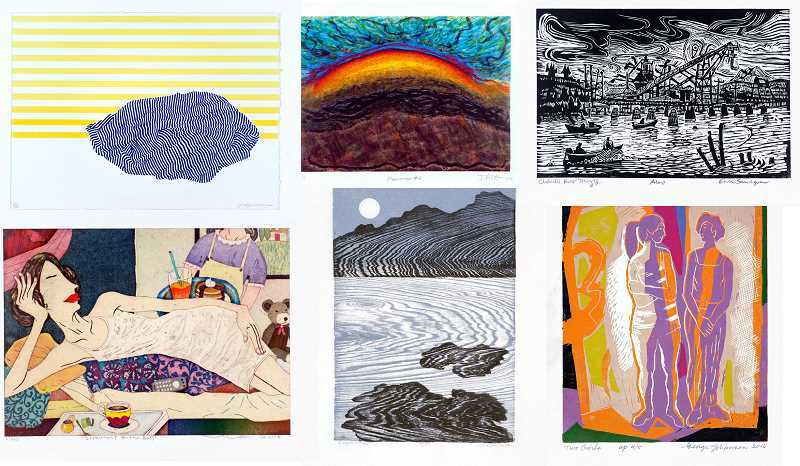 He has been a printmaker himself since the 1970s, he said. "I think this printmaking exhibit is unusual," Altfas said. "All these prints were done exclusively for a portfolio, housed in its own world. It exists as a part of a permanent record of printmaking at the time this was put together, originally in 2016. This tries to give the viewer the feel of what it is like to look at a portfolio." Altfas personally spent long hours to develop the exhibit and prepare it for the walls of The Walters, he said. "People will be looking back on it in 100 years or more, and I think that is an interesting perspective from an artist's point of view," Altfas said. Each piece was carefully chosen by each artist to be a representation of themselves, he said. "To me, I've looked at those prints in the course of putting this together dozens of times," Altfas said. "I always found that this collection represents something special. The prints themselves are beautiful, and they are inspiring. This is how the artist chose to represent themselves. It has a certain historical significance and can be endearing. I think that is what the holidays represent, the ideas that this is a family that strives to take care of itself." The exhibit can be seen when The Walters is open, from Mondays through Thursdays from 9 a.m. to 9 p.m. and on Friday from 9 a.m. to 5 p.m. The center is also accessible via the MAX Blue Line.